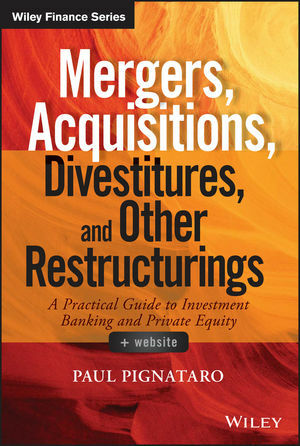 Paul Pignataro reveals the secrets behind growth through M&A in his new book, Mergers, Acquisitions, Divestitures, and Other Restructurings + Website. Through market shifts and regulatory changes, M&A has served as a solid approach to growth. Creating value through mergers and acquisitions is a highly coveted strategy, and Wall Street has long sought a clear technical understanding of the components of M&A as a key driver of growth. In this book, the author provides that understanding, covering all essential aspects of accounting and modeling for the M&A process. With over a decade of experience aiding billion-dollar restructuring deals, Paul Pignataro is in an excellent position to break down M&A from a finance standpoint. Mergers, Acquisitions, Divestitures, and Other Restructurings covers the financial accounting and modeling behind several M&A structures. Using the merger of Office Depot and Office Max, Mr. Pignataro fully addresses the entire integration, explains EBITDA, and other crucial performance measures. This text is for finance practitioners who want to explore every corner of the M&A process. This new text from the CEO and founder of the New York School of Finance is key for understanding how restructuring leads to growth and value creation. The importance of M&A shows no signs of slowing, meaning that finance professionals need to be able to accurately analyze the prospects and impacts of restructuring moves. Mergers, Acquisitions, Divestitures, and Other Restructurings + Website is the authoritative resource for doing just that.